After the glamour of chasing grayling on the pin last weekend, this weekend I went back out searching for gudgeon. My quest for a 3oz fish continued and armed with the kitchen scales and a ruler I was ready to begin my length to weight graph. 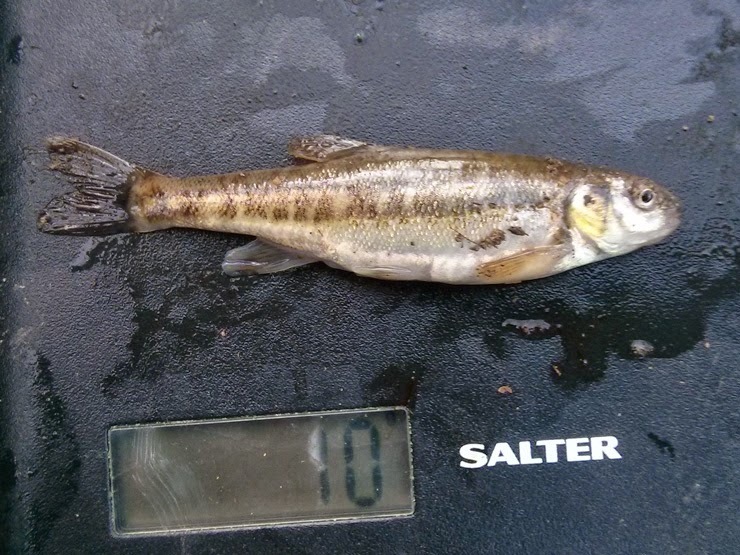 And this time they were feeding, all be it periodically - 10 gudgeon in total, four of them over 2oz. All were weighed and measured, oops I didn't write one of their lengths down. A pretty good start, but it is already obvious that some fat gudgeon and some slim ones are going to mix up a nice clean line. I'll keep collecting stats and see where I get to, probably need about 100 gudgeon before I attempt to draw the graph. I pleasant way to spend a cold afternoon, and I was joined for a while by fellow Gudgeon Society member Mark. Mark is also chasing a 3oz fish and is also armed with kitchen scales so we'll know when one of us finds a genuine three - good luck tomorrow Mark - swim is baited up and ready for you. 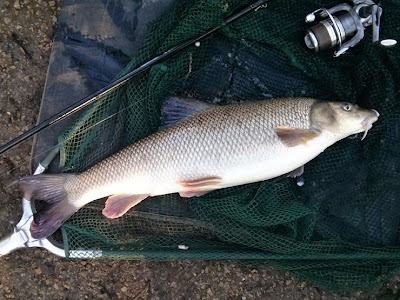 Quick roll on the way to the gudgeon spot, 4lb 14oz barbel. 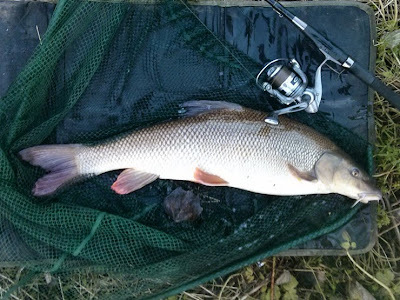 The barbel that crashed the party, 5lb 0oz. And a quick roll on the way home, 7lb 1oz. 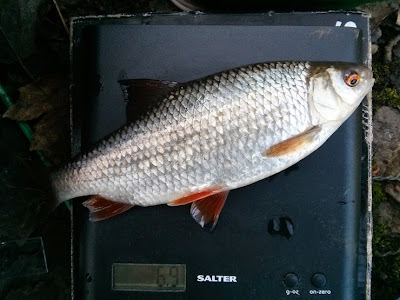 Barbel in miniature, an enviable quest! The epic quest for a three..! Great angling Brian. 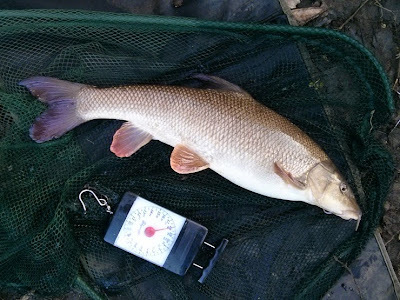 Managed to get out on the bank today for two hours on a stretch I've not fished before and only went and managed to catch my first ever Barbel! Chuffed to bits but boy what a fight. Followed yours and James' example of rolling baits and it worked a treat. Don't think I'll be fishing a static bait for a while now. 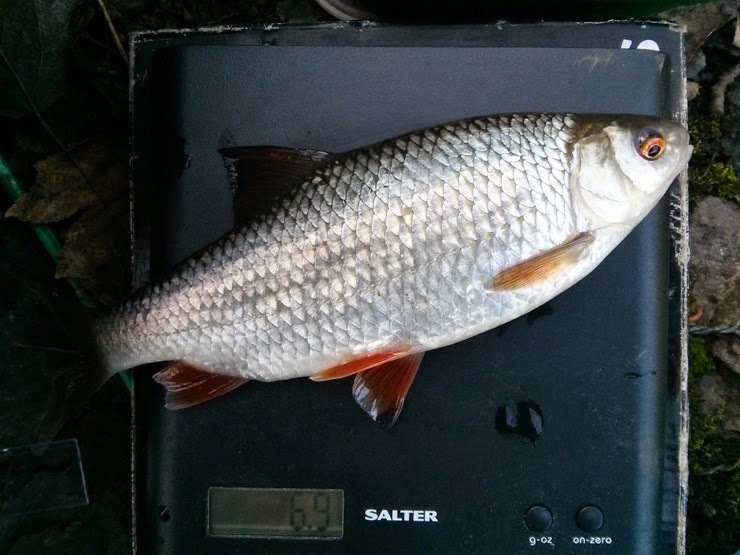 Well done - nearly there on the barbel!. I've still to use my LIDL scales for a minnow - shows what little I've caught in the last week or so. But considering how long the gudgeon are that you had today, would you say they are typical of what you've had on previous trips? Just out of interest, I'm assuming you don't "roll" for the gudgeon, but do you get them on the float? Cheers, getting close - 49 days left, just need 2 or 3 more. I think gudgeon are light weight, took a photo earlier and the sunlight was shining right through it. Fishing static for gudgeon, as they hang about with roach I'm pretty sure the roach would nail a moving bait - but I'm definitely no expert. I'll be very interested to see the graph, Brian. Why don't you start it now and publish updates as the data comes in? That'd be fascinating because it would show where the top possible weight should be for the river. I made such graphs for roach and silver bream and they give a clear median line that runs through variations in length. I began one for dace but don't have anywhere close by to catch large ones so it stalled. 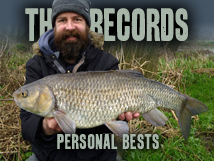 Mark helped me with my efforts supplying lots of info on roach. Brian, He's worth his weight in gold where stats are concerned. I reckon he weighs about eleven stone, so about a trillion quid! 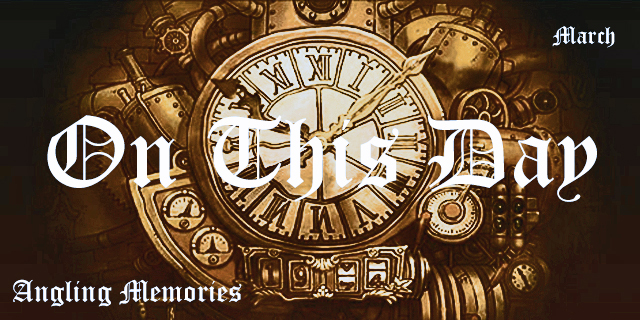 Seriously though, your data would be tight because it's all from one chalk stream. An urban one too. 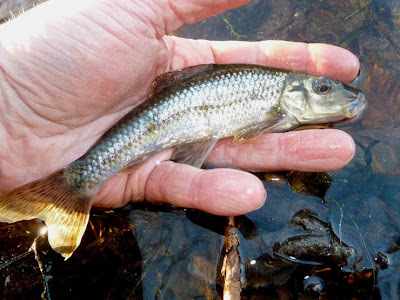 I'm going to mount a few expeditions on my little local stream where I've seen really big gudgeon in summertime and add what I find to your data. Maybe James will add his too? I've already made a graph out of what you've supplied and as you say, you do need a great deal more size variations to make sense of it. Sorry, thought you were talking about Mark Wintle. Doh! He will be interested though. I bet he will. Thanks Jeff, that survey is very interesting. I'll keep posting the length / weights on here and build up enough for a decent graph, if you and James post the same we'll build up a better picture quicker - thanks. And Mark and anybody else - that would be great. Once James has got his 2lb grayling..! Never fished the Tweed but it's water quality should be good (depending on where the gudgeon netting took place I suppose) as it has a head of large grayling in there which require good water quality. But the fact the graph matches your catch yesterday would suggest the bigger fish are @6 years old, which leaves one more year of life? Also makes me wonder what is required for an exceptional fish? I wonder if they are 6 years old. It's an urban river that unusually warm all year round - I know of a study (unpublished unfortunately) that found the growth rate of roach was off the standard scale. Perhaps they have a few more years left - hopefully. With a few of us weighing them we should find an upper weight limit, is there a 3oz fish in there I wonder - time will tell. You could be right with the warm water (and who knows what else is being contributed via Beddington to assist growth rates?) Never been keen on taking scales from any fish but anyone who can read them will tell how old they are. I haven't managed to catch a Wandle gudgeon yet but will happily assist with the details when I do. Hopefully the magic ingredient is in there, don't think I'm going to make it down this weekend but there are few left in the season.